The Supreme Court Collegium has recommended the names of four High Court Chief Justices and a High Court Judge for the elevation to the Supreme Court of India, reports Times of India. 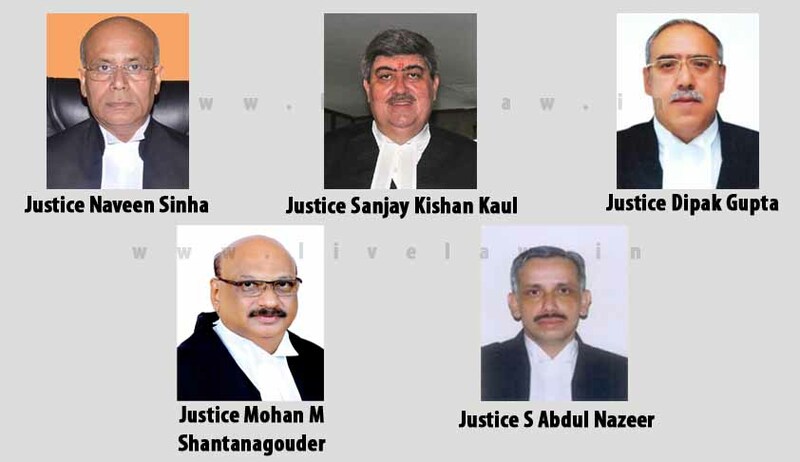 As per the report, the names of Rajasthan HC CJ Naveen Sinha, Madras HC CJ Sanjay Kishan Kaul, Chhattisgarh HC CJ Dipak Gupta, Kerala HC CJ Mohan M Shantanagouder and Karnataka HC's Justice S Abdul Nazeer have been recommended by the Collegium headed by Chief Justice Khehar. Though the names of two women Chief Justices (Delhi High Court CJ Rohini and Bombay High Court CJ Manjula Chellur). have been discussed, they could not find place in the current list. “It is rare for a person who has not yet become chief justice of an HC to be recommended as an SC judge. Justice R C Lahoti of Delhi HC was appointed an SC judge in 1998 when he was not chief justice. Of the present strength of 23 judges as against the sanctioned strength of 31 in the SC, there is no Muslim. Justice Nazeer, when appointed, will be the only one from the community”, states the TOI report.